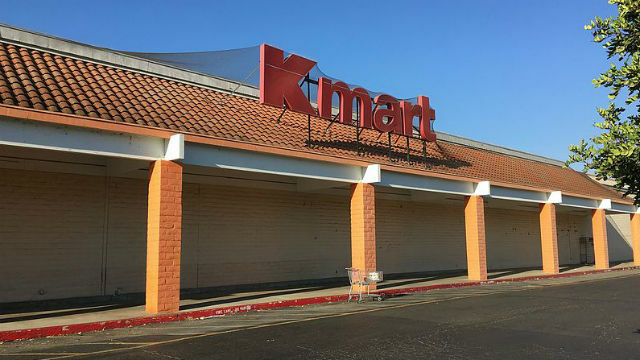 The Kmart store in Spring Valley is among 46 unprofitable outlets slated to start closeout sales this week, according to an announcement from parent Sears Holdings Corp.
Five stores in California are among the 12 Kmart and 33 Sears stores slated to close by November. This includes the Kmart store at 935 Sweetwater Road in Spring Valley. The other California closures are Kmart stores in Los Angeles, Antioch, and Clovis and a Sears in Santa Cruz. Sears Holding Corp. owns both the Sears and Kmart chains. The 125-year-old retailer has closed hundreds of stores in recent years to improve its bottom line. This latest announcement comes just days after Lowe’s announced it is closing all of is Orchard Supply Hardware stores five years after purchasing the chain out of bankruptcy from its previous owner, Sears Holdings Corp. The latest Sears and Kmart liquidation sales are expected to begin Thursday, Aug. 30.